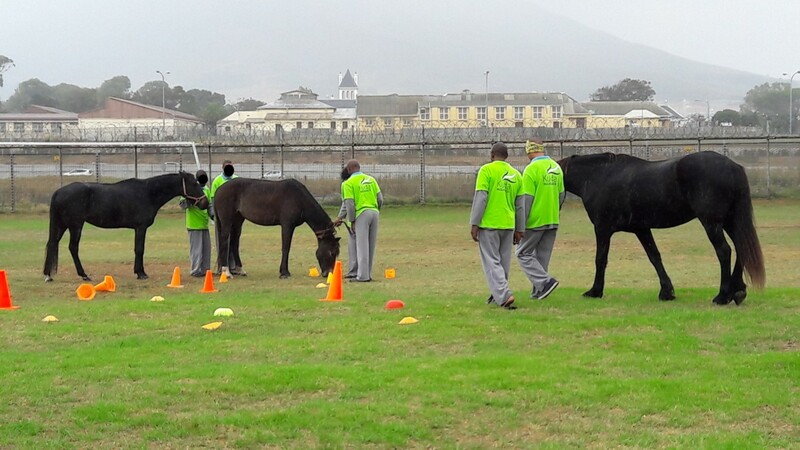 The aim of The Equinox Trust programme with the Forensic Mental Health Unit at Valkenberg Psychiatric Hospital is to improve the participants’ ability to work and function in a group, decrease irritability and aggressive behaviours, while improving interpersonal and social skills. Forensic patients placed at Valkenberg Hospital spend long periods of time (months to years) receiving treatment and rehabilitation. They are therefore ideally suited to benefit from eight to twelve-week long courses of equine therapy. They are a stigmatised and marginalised population, who are often misunderstood by society. Most of the patients come from impoverished socio-economic backgrounds, particularly in terms of education, and they find it difficult to engage in formal psychological talking therapies. Equine therapy engages patients in a non-threatening and interactive manner, and it has the additional benefit of getting them to be physically active in an outdoors environment. The pilot programme held at Valkenberg Hospital in 2015 and the subsequent two 8-week programmes have showed positive results in terms of improving patients’ social skills, and reducing irritability, and it can be anticipated that future courses will show similar results. To improve the participants’ ability to work and function within a group and to improve group dynamics.